It feels like spring time here - temperatures are in the 50s and rainy. Along with the spring-like weather, comes the new Filofax Spring organizers. There are so many new colors and styles to choose from. 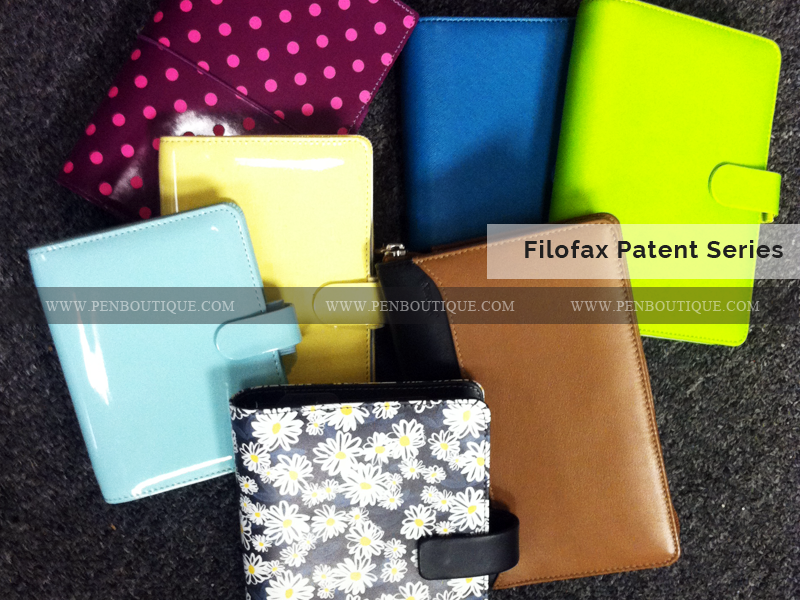 The Filofax Patent series features a high gloss patent finish with a matching color pen loop. There are the eye-pleasing colors: Lavender, Lemon and Duck Egg. It comes with the standard Filofax inserts: 2015 calendar/diary, #1-6 index, To do list, Contacts, Ruler/page marker and assorted notepapers. There is a space in the front cover for cards and a pocket in the back for a notepad. These are available in the Pocket and Personal sizes only. My favorite is the Lemon color - a nice sunshine yellow for a rainy day. The Daises organizers put a smile on my face since they are my favorite flower. It has a soft touch cotton twill canvas cover, with a field of daises all around. This is available in the pocket or personal size. The personal size has 6 card slots in the front and space for a notepad in the back. I did need to purchase the To do refill for it since it does not arrive with that. I would be lost without my to do list! The Domino Patent series has a new design - spots. The Pine and Aubergine organizers have spots on them. Yes - I had to look up the word Aubergine - it is a British word for eggplant. The organizer looks more of a dark fuchsia/purple with pink spots than a typical eggplant color (at least to me). The Domino Patent also has the ever popular Fluorescent Pink and Turquoise colors. Only the Pink color is available in the pocket, personal and A5 size, the rest are available in personal and A5 only. The Saffiano series returns with Pear and Aquamarine, available in Pocket, Compact, Personal and A5. The Pear is a very bright yellow green color and the Aquamarine a nice deep blue green. The Pear compact is the perfect gift for my teenage cousin. She will always be able to find it in her bag. And last, but certainly not least - a Filofax for my dad. He loves his Nappa personal size zipped organizer. He is the envy of his Florida neighborhood. The rich leather colors of Black and Taupe together are quite handsome. These are available in personal and A5 size, zipped or without. There is a pocket on the front cover and a zipped pocket on the back, which is perfect for a little extra cash or a cellphone. Remember that we have most of these items in stock now and more coming each week. Just wish the rain would stop for a bit and let the sunshine through so I can start on my flower garden.